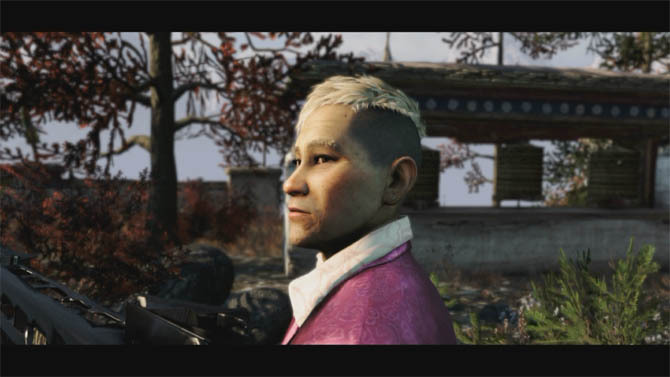 Far Cry 4 has got to be one the unexpected success stories this year and I for one am absolutely loving it. There's just so much to see and do in Kyrat that the game certainly warrants a strategy guide. So here it is, a complete guide from my experience in the game, covering everything from exploration and the campaign through to weapons and skills. Upon starting the game, Kyrat seems like a massive wilderness with 95% of the map hidden behind fog and unknown destinations. You'll be wondering which areas to explore first and how to really start uncovering the map. At this stage, your strategy should focus on opening up the map to provide new opportunities and removing that annoying fog. This is achieved by liberating any of the nearby Bell Towers, which are those towering structures that recite propaganda material to the local residents. Most are unguarded, just requiring you to climb to the top and destroy the radio whilst avoiding a deadly fall. 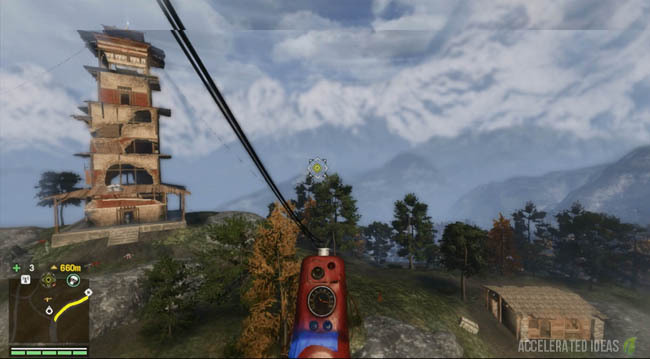 For the majority of the game, Bell Towers are easy to liberate using nothing more than the Buzzer (mini-helicopter) which is presented during one of the early Campaign missions. If you haven't seen the Buzzer yet then you should continue playing until you've at least got the location marked on your map. For every Bell Tower you liberate you'll get a nice chunk of the map revealed, including animal locations, roads and terrain but you'll also get a free weapon! With new areas of the map revealed you'll be able to start hunting animals and upgrading some of your items. There is no reason to actively upgrade the rest until much later (if at all in some cases). Do not spend any money on ammo refills or new weapons, simply use the ones given to you from the Bell Towers. Lastly, at this stage of the game you could consider buying a Loot map of the local area to help you gain money at a faster rate, but I'll come onto this later. The Kyrat map is split into several sections; South, Mid and North Kyrat. The difficulty level increases as you venture closer to North Kyrat and towards Pagan Mins fortress. Outposts will have more alarms and more troops. The key to exploring the map is to understand the Bell Towers which are evenly spread across the map. They are highlighted on the map by the white icon which looks like a radio tower. Once you liberate a Bell Tower the fog from the surrounding area will be cleared and local villages will be labelled. Animal locations will also be marked on the map. There is no requirement for liberating a particular Bell Tower and they can be liberated in any order. You'll still want to liberate them one by one though because travelling through vast amounts of fog is annoying, especially with no Fast Travel point close by. Unlike Outposts, liberating a Bell Tower does NOT provide you with a Fast Travel point so you'll want to work through Bell Towers and Outposts together so you've got a clear view of the map and a point of departure close by to your objective i.e. the area you're currently exploring. Note: The North area of Kyrat is locked until you complete the mission: "A key to the North" which is just over half way through the Campaign missions. Until thats complete you will not be able to travel to the North side and liberate any Bell Towers. There's only one way through to the North and thats via the Bridge, all other routes are blocked by the huge mountain range (even for the high flying Buzzer). As mentioned above, the Buzzer is the best way to capture Bell Towers by simply flying up to the top level and landing next to the radio. The Buzzer will probably drop off the edge of the Tower after you land but don't worry because it relocates to ground level, just check the map to start flying again. One important note, there is one Bell Tower located in the North West of the Kyrat which has a seemingly impossible entry point. You need to capture this Bell Tower by climbing the nearby cliff side and entering the Tower from the secret tunnel underneath. All other Bell Towers can be accessed directly by climbing the tower as usual. Outposts are highlighted on the map by a little Red flag and you can often see their telltale black smoke rising in the distance. The big difference between these and Bell Towers is that captured Outposts will give you a Fast Travel point as well as a Trading Point and new quests. The Fast Travel point is essential in reducing the time required to explore deeper into a particular area without unnecessary vehicle travel. In the South of Kyrat, Outposts usually have a single alarm and not many troops. As you progress Northwards the number of alarms increases and so does the number of troops. Reinforcements are also increased in tandem with the alarm level and helicopter support is common in North Kyrat. Something to bear in mind when capturing Outposts and that's the caged animals which are often trapped inside. If you release these animals from their cage then you create the perfect distraction decreasing the chance of an alarm being raised. Similarly, throwing bait inside an Outpost will attract nearby predators causing a distraction in a similar way. The downside to inviting predators to the party is that they can turn on you too. In some Outposts there's a Mortar Point which can be used by yourself and the enemy. If you clear the first wave of guards but the alarm is raised then use the Mortar Point to destroy the approaching reinforcements with ease. It saves ammunition and is a hell of alot of fun. Use cover and the smaller buildings to heal yourself when necessary and even retreat outside of the Outpost grounds to buy some time. Your progress will not reset and you can simply stroll back to the Outpost to carry on with a full health bar. Alarms are clearly shown on the mini-map when you're within an Outpost area. Depending on the Outpost there may be just one alarm or several. The game tells us that alarms work in different ways but the most common of these is a yellow box strapped to a wooden post. Locate these alarms and make sure you shoot to disable them immediately. Once you're detected the enemy will try and raise the alarm by running towards the nearest Alarm. You can prevent the alarm by killing the troop before he reaches it. Disabling an alarm will prevent one level of reinforcement from arriving, thus saving you the hassle of fighting more troops to take a particular Outpost. Kyrat has a great range of animals ranging from Leopards and Bears to Demon Fish and Honey Badgers. In most cases you'll simply stumble across them by accident or find yourself under attack if you stray too close to one of the predators. But as you reveal more of the map you'll notice that animal locations are clearly highlighted and that's no coincidence. It means that at that location you're more likely to find that animal. That doesn't mean to say that you won't find other animals in the same area because you do, but it's a great hint when you're searching for the missing skins for your upgrades. Collecting animal skins is simply a case of killing the animal, walking up to it and them holding the action button to collect both skin and bait, the latter being used to cause a distraction against the enemy. I found that circling the nearby area using the Buzzer was one of the best ways to spot animal locations which were sometimes hit or miss. You can also use the Hunting Syringe to highlight animals with little red icons in your field of view. To collect more skins you need to complete clean kills using a knife or bow. Knife kills against animals are very hard to achieve and using the bow is also difficulty without stealth tactics. Therefore, if you're not worried about having to find twice as many animals then go rushing in with guns blazing to get the job done quickly. Once you've collected enough skin for one of your upgrades, the little Yellow Spanner icon will appear in the bottom right corner of the screen. This signifies that a new upgrade is available and you can open the Crafting menu to check what that is. As mentioned above, forget upgrading anything except Loot Bag, Money Bag and Ammo. The other upgrades are optional and I didn't find that extra Heavy Ammo or Throwables was really worth it, I'd rather sell the skins and save up for a Signature weapon. 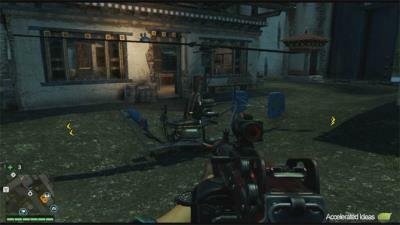 There are two skill types in Far Cry 4. One being the Elephant which focuses on health and syringes and the other being the Tiger which focuses more on combat. Of the two I went more for the Tiger upgrades giving me better Takedowns, faster reload and aim. I didn't feel the need for many of the Syringes which in my opinion aren't that great. The list below shows the upgrades that I chose and I was more than happy with them. I'd make the point to certainly upgrade your first Elephant skill tree row to the max (Unyielding strength). That one relates solely to health bars which you can't get enough of. The Takedowns are particularly useful especially the Chain Takedown which allows you to kill multiple enemies just by kick starting the first takedown. Some of the other skills relating to hip fire accuracy and reload speed are of particular importance. Far Cry 4 contains a large selection of weapons which range from shotguns and SMG's to Assault Rifles, Sniper Rifles and Rocket Launchers. There's also the hunting bow designed for animals and silent attacks. Although very weak, Sidearms play an important part in the game as they're the only weapon you can use from inside a vehicle. Standard weapons can be given as rewards for liberating Bell Towers, completing Longinus missions or bought from the Trading Outposts which are located at every Outpost, Fortress or sizeable building on the map. You should therefore avoid buying SMG's and Assault Rifles because these are common rewards and are frequently dropped by guards you kill. Now's probably a good time to discuss which weapons are best. In my opinion, shotguns and pistols can be avoided altogether. Assault Rifles and LMG's are far more useful for blasting your way through Outposts and Campaign missions. Sniper Rifles are great for killing enemies from great range but they reduce the fun of the game considerably because the enemy finds it hard to retaliate at long range without a Mortar position. Most weapons have attachment slots which you can purchase at any Trading Post. These attachments include barrels, scopes and mags. Of particular significance is the suppressor attachment which plays a huge role in the game. Any weapon attached with a suppressor will reduce the detection rate of the enemy. They don't stop you being noticed altogether but you can safely fire off a couple of shots without any alarms being raised. This gives you a significant advantage when capturing Outposts because you can aim for headshots without too much trouble. Sadly most LMG's don't have a suppressor option so it's down to your Assault Rifle for that privilege early on. There's also a great selection of Signature Weapons in the game which I covered in my previous post. I strongly recommend that you save your money and unlock the Warrior Signature weapon early in the game by capturing Royal Army trucks. It's a really versatile and still powerful Assault Rifle that'll see you through most of the Campaign missions and Outposts. all you'll need to unlock it is the Vehicle Takedown skill and a close eye on the map for Royal Truck icons. If you're thinking of replaying some of your Outposts via the Outpost Master challenge then equipment is something which can really spice things up. Laying mines around an Outpost and waiting for reinforcements to fall victim or strapping C4 to a vehicle and letting it slide down into a base are just two example of a varied take on Outpost capture. But outside of replaying the Outposts, especially co-op, there's little need for Mines, C4 and Molotovs which are only so useful. Grenades are possibly the best of the throwables at your disposal but don't get bogged down too much with buying equipment and just enjoy those free offerings from ammo crates when you see them. Money isn't really a problem in Kyrat thanks to the generous rewards for completing just about any task. Combined with loot chests and rare collectibles you'll be earning thousands of Rupees in a short space of time. But you need a place to store all that money or you won't be able to collect any more. The Money Bag is responsible for that and its part of your crafting menu. Make sure you check the animal skins needed to upgrade to a large bag and avoid losing out on any money along the way. Although money isn't a problem for most things it can be expensive to buy LMG ammo later in the game and it's very expensive to try Signature weapons without a massive stash of cash. Some of the more expensive Signatures cost around 500,000. When you get to this stage you're going to need some valuable items such as Gold and Diamond which can be traded in for 50,000 a piece. Buying all the loot maps and going on a loot hunt with your Buzzer will help you earn a steady stream of money in the latter stages of the game. Although it's important to upgrade the money bag early in the game you don't really need the final upgrade because you'll spend it well before you get into the millions. Throughout Kyrat you'll see many posters littering the villages and Outposts. You can rip down most posters by holding the action button when standing next to them, whilst others need to be burnt down using Molotov's. Every 10 or so posters you'll receive an XP bonus which will help you unlock more Skills from the menu. Although a small reward they are so easy to rip down that you should get them done whenever you explore a new area or capture a new Outpost. Masks are also a rare item that you'll sometimes find scattered through the map. If you want precise co-ordinates then a purchased map from the Trading Outpost will highlight all of them on the map at once. Every mask you collect will reward you with a Guns for Hire token which you can use to call in friendly reinforcements during Fortress or Outpost capture attempts. Sneaking is a tricky art to perfect which requires great patience and skill. Although mentioned briefly at the start of the game it's easy to forget that your character can throw stones to distract an enemy and force them to move to a particular position. Until the enemies back is turned the Takedown option will not appear. Therefore you should throw stones to move your enemy into position, giving you the chance to perform a silent takedown. The detection bar is a great mechanic for understanding the enemies level of detection but can be hard to understand at first. Basically, anytime a guard sees you via direct line of sight, the detection bar will start to fill up. It's not really a bar as the game describes, but a white arc in the middle of the screen. The arc shows the general direction from which you have been detected and as the arc grows in size the level of detection increases. Once the arc reaches a certain size you have been detected. This dreaded detection can mean many things in the game ranging from troops raising an Outpost alarm to an outright mission failure in the Campaign. Therefore it's important to understand and lean the art of sneaking and takedowns. On the Skill menu there are many Tiger skills which can improve your Takedown abilities. Namely the Knife, Gun, Vehicle and Chain takedowns. The game is clever enough to offer you the particular Takedown which suits the situation so if a Chain takedown is possible then that option appears. If only a Knife takedown is possible then only that option appears. You are not punished for maxing all the way to the Chain Takedown slot. Travelling to waypoints without a vehicle is painful to say the least. Thankfully Far Cry 4 offers a range of vehicles and a convenient Auto Drive mode which automatically takes you to the selected waypoint. Auto drive is only available when you're on the major roads rather than the mountainous tracks or off road completely. I also found that Auto Drive is quite slow but can be improved by accelerating directly forward (no steering) which will make the vehicle travel faster but still automatically turn corners for you. Of all the vehicles the Buzzer is the most useful for many reasons. First and most importantly you can cut through the map with a direct ascend to your destination without worrying about navigating through the roads. Secondly it's great for running circles and spotting animals down below. Other vehicles types have their place with boats being great for dissecting the map quickly whilst the standard jeeps/trucks are the most stable and easiest to drive. Some of the other vehicles are insanely difficult to control. The Quad Bike and Snowmobile in particular are nearly impossible to drive without Auto Drive and the Military Trucks are incredibly slow but resistant to damage. Campaign missions are shown on the map via the yellow icon with two swords crisscrossing. They don't always appear in sequence and you'll regularly see an A (for Amita) or S (for Sabal) instead. All of these missions increase your Campaign progress and take you one step further towards the end of the game. In some circumstances a campaign mission will not appear. This is a common problem which confused the life out of me too. All you need to do is complete one of the Yogi or Longinus missions to trigger the next Campaign marker on the map. Another topic I want to cover in this strategy guide is the difficult Campaign missions where I got stuck. These include escaping the prison, looking for an entrance to the Area and several others. I wasted a fair amount of time on these so I'll save you the hassle of doing the same thing. At the start of this mission you're told to find an alternate way into the Arena because the front door is blocked. Facing the front door which is blocked, stand slightly back from where the crowds are, look up and right and you'll see a grapple point. Climb up there and then another grapple point is towards the entrance, allowing you to swing across and onto the secret ledge. There is no need to scout the area for an alternative door or climb any mountains. Near the beginning of the game you might find that the mission icon for the Golden path disappears leaving you with only L and Y. At this point you have to complete the first mission for Yogi and Reggie which takes place in Shangri-La. Only then will the yellow mission icon appear again. This mission makes you think that you need to silently kill off the guards to sneak into the truck, which is really hard to achieve. But you don't actually have to do this at all. Instead you can sneak round the back of the building where the truck is located and hop straight in the back. You'll only have to kill 1 or 2 guards to get there. This tip will save you loads of failed attempts. At the start of this mission you're told that you need to escape the prison and that requires you to build a grapple hook. You need to find two parts to build it. The important thing to note here is that you need to turn left at the end of your cell, then onto the ledge outside and follow the path round to another cave entrance. There is no knife or weapon for you, so you're left to sneak past the demons inside the cave and find the two parts. Payback is a really weird mission, given by Yuma, it requires you to kill Kalinag inside a temple area. He's got the ability to call in white tigers all the time and also teleport away from you whenever you get close enough for a kill. So how are you supposed to kill him with that useless bow and arrow? Here's the tip, instead of trying to finish him off with arrows let him teleport away. As soon as he teleports immediatly look for his location because he'll be coming down from one of the edges into the middle of the temple. Nows the time to kill him so take aim at one of the many ceramic pots and fire arrows at it. A direct hit will cause the pot to explode, hurting Kalinag if you're lucky and giving you the chance to use a Takedown to finish him off. You can also one swipe kill the white tigers rather then trying to kill them with the bow.